Posted by dr. gonzo in Architecture, Prairie style. If you keep seeing me banter about Frank Lloyd Wright, casually referring to Prairie style, and are left wondering what the heck I am talking about, well, then, you’re probably not alone. Today we take a short break from immersion in the architectural classroom that is Oak Park, Illinois and try to discover a little bit about Prairie style. Where it comes from, what it means, what it looks like, and the tools to locate the Prairie influences in your own neighborhood. Join me, I will try not to ramble. Prairie style is one of the few architectural styles to have originated in the United States. The short-lived style evolved, matured and waned in popularity between about 1900-1920. It was developed by a group of Chicago architects that were affiliated with Frank Lloyd Wright, or his mentor Louis Sullivan (of Adler and Sullivan); the style and the architects became collectively known as the Prairie School (although there was never really a school). It is Wright’s 1893 Winslow House that may be the very first Prairie style house, and he is the avowed and undisputed master of the Prairie house. The style comes straight out of Chicago, Wright established his first architectural practice in the suburb of Oak Park. 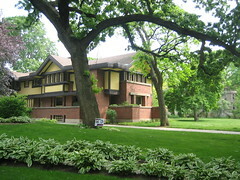 Oak Park, as we have seen, along with adjacent River Forest, Illinois, contains one of the largest concentrations of residential Frank Lloyd Wright buildings in the world, as well as masterpieces by an assortment of other well-known Prairie School architects. *Frank Lloyd Wright – (wiki) – As said, the creator and undisputed master of the Prairie style house. 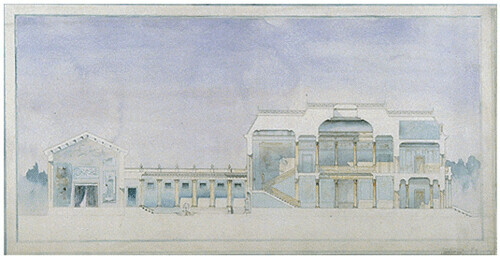 Wright was an interesting and complex man whose architectural style was as varied as his event filled life. The wiki is a good place to start but Wright’s whole story has been told in multiple volumes by several biographers, and even, filmaker Ken Burns. Wright’s major works: Guggenheim Museum (NYC), Arthur Heurtley House (PDF), Fallingwater, et. al. 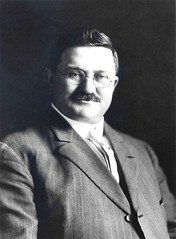 *George Washington Maher (pictured) – (wiki) – For a time, Maher worked under early Wright mentor and employer Joseph Lyman Silsbee, it was then he was associated with Wright. Maher eventually established his own practice. He was a very important Prairie School architect. The wiki is a good jumping off point, make sure to look at the reference links in the article. *Robert C. Spencer, Jr. – (no wiki: bio) – Spencer was a friend of Frank Lloyd Wright who, unlike Wright never abandoned the references to tradition in his work. To this end he was heavily influenced by two years spent in Europe on the Rotch Traveling Scholarship. Spencer’s work utilizes geometric, planed surfaces and plays on light and shadows. Spencer’s major works: Chicago Public Library (interior), published 50+ articles including an important first article on the work of Frank Lloyd Wright in a 1900 issue of Architectural Review. *Thomas E. Tallmadge – (no wiki: bio) – Tallmadge was a well-known Chicago architect who designed a variety of buildings. Tallmadge was tragically killed in a train accident in Douglas County, Illinois in 1941. Oddly, he was the only person killed it would seem. As a partner with Vernon Watson, their firm, Tallmadge and Watson designed many Prairie style buildings. Later they migrated toward a more traditional style and designed more than 25 churches throughout the Midwest. 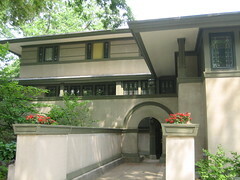 *John S. Van Bergen – (wiki) – Van Bergen worked in Frank Lloyd Wright’s Oak Park studio beginning in 1909. Under Wright he did drawings for, and supervised work on the famous Robie House and Laura Gale House. The wiki is a great starting point (I compiled it for you). Make sure you see the main references Martin Hackl’s web pages about Van Bergen are amazing. Van Bergen’s major works: Allan Miller House, A.O. Anderson House et. al. *Eben Ezra Roberts (pictured) – (wiki) – Roberts was an important Prairie School architect despite the fact that his only professional association with Frank Lloyd Wright was as a competitor. Compete he did, Roberts’ practice rivaled Wright’s, in Oak Park alone Roberts designed more than 200 houses. Roberts had his own interpretation of the Prairie aesthetic and it shows in his works. Another Dr. Gonzo compiled wiki on the man is a good jumping off point to learn more about Roberts, one of my favorite architects. Roberts’ major works: Henry P. Magill House, Frank W. Hall House, Charles Schwerin House, Louis Brink House, E.E. Roberts House, Masonic Temple Building (all in Oak Park), et. al. *Marion Mahoney Griffin – (wiki) Mahony was a Chicago native and 1894 graduate of MIT. After working briefly with her cousin Dwight Heald Perkins (see below) she went to work for Frank Lloyd Wright. She worked with Wright for 14 years becoming one of his top designers and designing numerous interior furnishings for Wright projects, and later her own. She was also well known for her distinctive Japanese-influenced style of architectural rendering; a skill that brought much acclaim to Wright’s studio. She helped complete many of Wright’s unfinished projects when he ran off to Europe. She married Walter Burley Griffin (see below) in 1911 and they practiced together for the next 28 years. *Walter Burley Griffin – (wiki) – Griffin was a native of the Chicago suburb of Maywood. He worked with Frank Lloyd Wright for several years and after that under a number of other important Prairie School architects (incl. 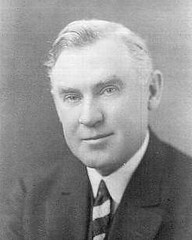 Robert C. Spencer Jr., and Dwight Heald Perkins) He and his wife Marion Mahony (see above) lived in Australia during which time they executed many designs including numerous city/town plans. Griffin was commissioned to design the Australian capital of Canberra, though he eventually left the project and none of his building designs were ever executed. Griffin’s major works: Newman College, City/town plans in: Leeton, Griffith, Eaglemont, et. al., all in Australia, Capitol Theatre, John Gauler House, et. al. *Dwight Heald Perkins – (wiki) – Perkins was a prolific architect who originally hailed from Memphis. He was well-educated, despite having only completed three months of high school. He was later educated at MIT and returned to Chicago in 1891 where he worked for Burnham and Root. He served as Chicago School Board architect, a position he left over politically charged accusations of incompetence. Those accusations are regarded to have been because Perkins refused to kowtow to the corrupt school board members in Chicago. Perkins was nearly deaf by 1925, effectively ending his career. He died in 1941 in New Mexico while on vacation. These are but a few of the “Prairie School” architects, there were other important architects as well. The Wikipedia article on Prairie School is scant in information but it does list several of the notable architects. There are a number of elements very common to Prairie style, depending upon the house, it may contain all or some of the common elements listed below. By knowing what to look for you can find Prairie style homes all around you. I have included a description and, where it’s useful, I have linked architectural terms to the related Wikipedia article (some don’t have sources but these topics are not controversial). *Roof: Obviously they have roofs, but the roof is one of the items that give away Prairie style houses. Roofs on Prairie homes are usually low-pitched roof, sometimes flat even. Many times, this low-pitched roof will be a hip roof. A hip roof is distinguished from a gabled roof because a hip roof meets the walls of the house on all four sides, it’s a pyramidal shape. The eaves on a Prairie style house are usually wide, and usually overhanging the edge of the wall significantly. *Height: Prairie houses are generally two stories, and can commonly have a one story wing, and /or a large porch. The porch on a Prairie house will overwhelm the front entrance, often seeming to bury it completely. In many cases, the porch is supported by massive pillars. *Horizontal emphasis: This is the key to a Prairie style building. Finding that horizontal emphasis in the eaves, cornices, even the brick courses, is what will be a dead give away for a Prairie style house. Some Prairie houses even continue the theme using longer, narrower Roman bricks instead of standard bricks. At first it might be kind of difficult to spot, but once you’ve seen it, once you know what is meant by “horizontal emphasis” you will never miss it again in any building. This is the sort of knowledge that lets you impress your friends, when all of the sudden you know about how old a building is just by looking at it for a second. *Chimneys: Massive chimneys (larger and wider than what is considered “normal”), often centrally located in mature Prairie homes. Early Prairie houses sometimes have the chimney along one of the facades, but it is still usually larger and wider. This stemmed from Frank Lloyd Wright’s belief that the house should contribute to the closeness of a family, a large hearth, given center place, was one way to accomplish this. *Setback and entryway: Expect many Prairie houses to be set further back from the street than the counterparts in their neighborhood. Of course, space considerations sometimes prevent this. Entrances on Prairie style houses can be difficult to locate or in unexpected places. There are four main types of Prairie style home with a few derivatives of each of those types. Two of the types fall into a sweeping style category known as American Foursquare. American Foursquare was probably the most popular incarnation of the Prairie aesthetic. Foursquare designs were distributed through pattern book and mail-order companies, including Sears, contributing to their popularity. There is almost guaranteed to be a Foursquare pattern-book house in your town if it has more than 100 people, and is located in or around the American Midwest. Foursquares are easy to pick out. They are symmetical, square shaped, have low-pitched hip roofs, and large front porches supported by corner pillars. The entrance can be located on the front or on the side, depending on which “subtype” of Foursquare the house is. 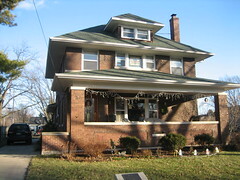 Many Foursquare houses show a heavy American Craftsman influence and commonly have a front, centrally located dormer. They are usually brick, or stucco clad, but can be wooden as well. Gabled Prairie houses, that are not of the Foursquare variety simply have a gable roof, as opposed to the hip roof more commonly seen. They still have the horizontal emphasis and overhanging eaves that are hallmark of Prairie. Other elements such as sprawling terraces and art glass are also commonly found in gabled Prairie houses. Most high-style examples of Prairie architecture are asymmetrical. The may have sprawling porches and terraces, large one story ells, or areas that extend beyond the general height of the house. The asymmetrical group of Prairie homes often have most or all of the elements described above. Sorry, no online resources this time, there are too many to choose from. I suggest you start with Google and the names of the architects. Tomorrow, we dive into the evolution of Frank Lloyd Wright’s Prairie style. Please continue in a similar manner.